Play on pinks. Penguin Hardcover Classics (Coralie Bickford-Smith, designer). 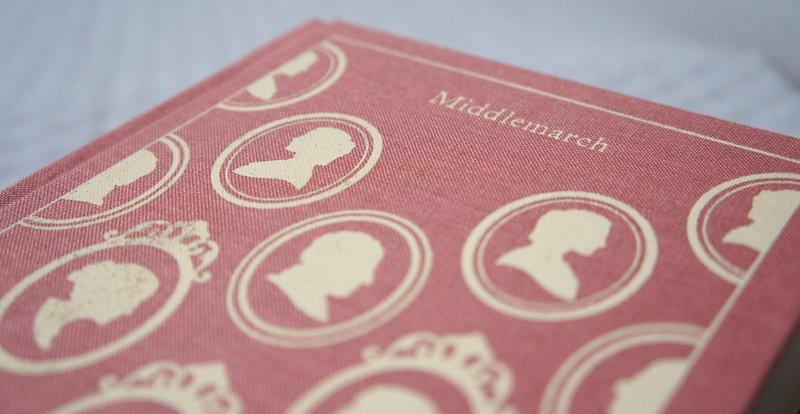 I thought I would start this series off with Middlemarch, my favorite book of the three. Actually, I think this is one of my favorite books in the world. Why, oh why, did Dorothea marry Mr. Casubon? Oh, Dorothea. *sigh* But I digress. Let’s take a closer look at the cover to get started. Ivory silhouettes on a rosy background: Like a cameo pin in book form. Exquisitely pointless. Jardin de Chanel Blush Camélia de Rosé. Now that we’ve spent some time taking a good look at this blusher, I’ll tell you why this Middlemarch cover inspired me to dig it up. 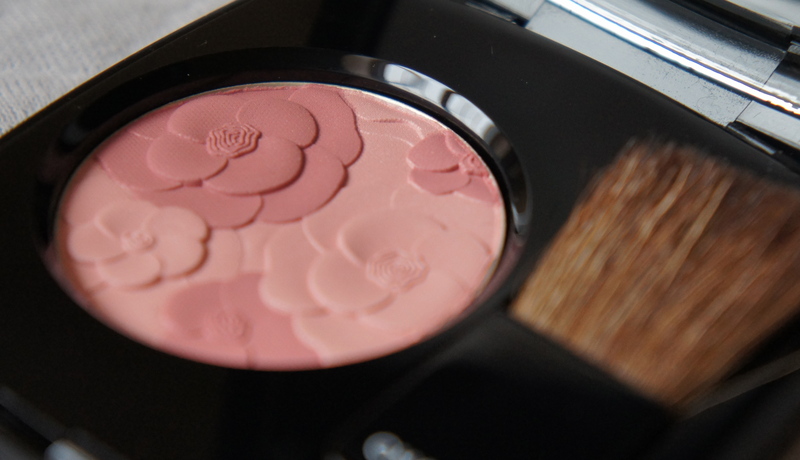 It’s not just the color of the blusher. Something like Chanel JC in Rose Ecrin would’ve done just as nicely color-wise, I suspect. It’s something in addition to color. If the cover references cameos, and if we take a moment to imagine a cameo brooch or pendant in our mind’s eye–a detailed silhouette, carved out in relief from a shell, the silhouette appearing in a creamy shade of white or ivory against a delicate rosy or coral background…well, it’s this three-dimensional-relief factor that made me think of this blusher. I mean…for what it’s worth. lol! That side of things really spoke to me. So I guess we’ve established the blusher as the star of this look. To round it out with color for eyes and lips, I chose a classic, rosy-pink lippie and added a new acquisition–a plummy-rose Burberry shadow. IRL, I imagine that I would probably add a touch of charcoal pencil, smudged into the upper lashline and very subtly into the outer corners, just to add some definition to the eyes. I would definitely take a moment to smudge the lipstick very slightly around my lip line–I feel that anything too harsh would be jarring with this look. And if I could ever bring myself to dip a brush into this tiny pan of blusher (it’s about the same size as the shadow! ), I would go for a classic, diffuse haze of color on the ample apples of my cheeks. Rockin’ a rosy vibe. 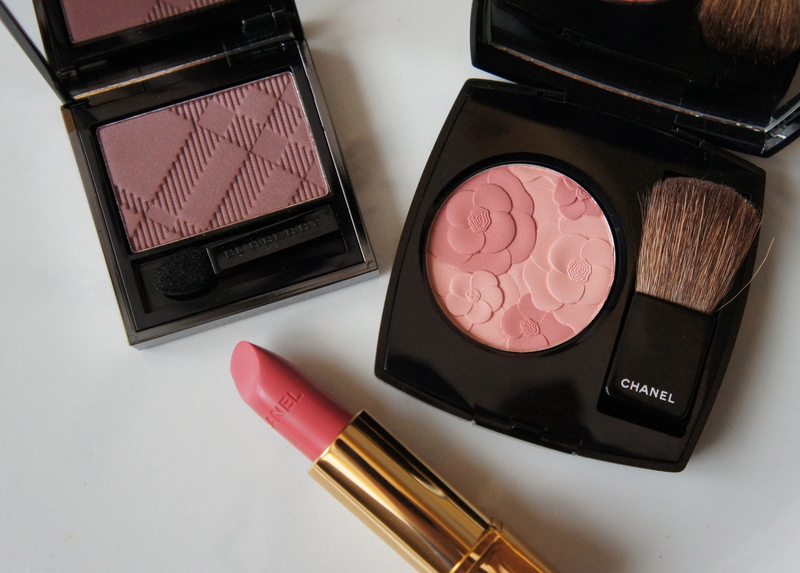 From the left, Burberry eyeshadow single in Antique Rose; Chanel Rouge Allure lipstick in Séduisante; Jardin de Chanel blusher. As an aside, I don’t really have in mind a vintage, nineteenth century vibe for this look, or indeed any of the looks in this series. I’m trying to work out some modern, wearable looks that will fit into real life. (I’m not sure any of the ladies in Middlemarch would’ve done any more than bite their lips or pinch their cheeks to bring up their color, anyway! Hair grooming was probably more their speed than cosmetics.) But in deference to the inspiration for this look, I would probably steer clear of obvious highlighter or finishing touches of glitter. A touch of creamy ivory to highlight the inner corners of the eye, the brow bone, a touch down the center of the nose, and a touch to highlight the cupid’s bow…I think that might be ideal. I’d wear this look to work. Feels like a day look, at any rate! I’d be very curious to know what you think of all this. Did you (wisely) pass on this pointless-if-pretty blusher? Are you wondering if this eyeshadow will make my eyes look bruised or sore? (I’m thinking it probably will, but it’s fun to try!) 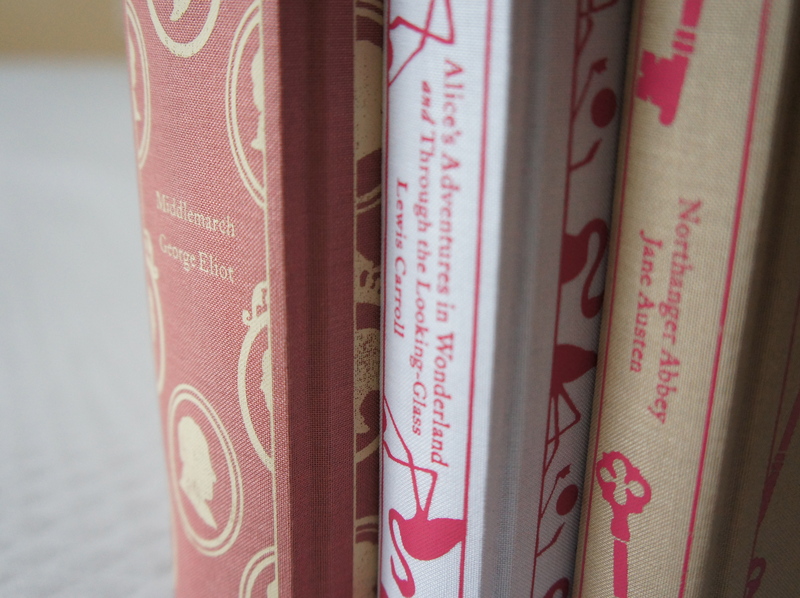 In the next post, I’ll try pulling together an evening look to harmonize with the Alice in Wonderland cover. We need some color and contrast after all this soft rosiness!